Number 3, shown by a straight line. 2. Graph velocity (vertical) vs time interval (horizontal) of the motion at a constant acceleration. 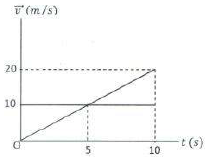 What is the magnitude of the acceleration according to the graph? 3. Someone traveled by car from town A to town B, shown by graph below. 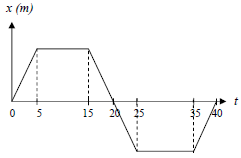 Vertical line as speed and horizontal line as time interval. What is the distance traveled by car during 30 minutes to 60 minutes. 4. Graph velocity (vertical line) versus time interval (horizontal line) informs the motion of a car from rest then moves until stop for 8 seconds, as shown in figure below. What is the distance traveled by car from 5 seconds to 8 seconds? The distance traveled by car from 5 seconds to 8 seconds = 10 + 20 + 20 = 50 meters. 5. The distance of the last 5 seconds according to graph below is …. 6. Graph velocity vs time interval of the non-uniform linear motion of a car. 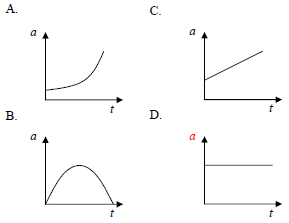 a = acceleration, vt = final velocity, vo = initial velocity, t = time interval. 8. If an object is thrown vertically upward above the surface of earth, then which is the graph of acceleration experienced by the object. When an object moves vertically upward, the acceleration experienced by an object is acceleration due to gravity. The magnitude of acceleration due to gravity is 9.8 m/s2 and the direction of acceleration due to gravity is the to the center of Earth. The constant acceleration is characterized by a straight line parallel to the axis t and perpendicular to the axis a. 9. Based on the graph below, determine distance traveled by object for 20 seconds. 10. The motion of three objects, each illustrated by the graph below. Determine the correct statement for the motion of all three objects. Based on the graph, object moves at a constant acceleration. 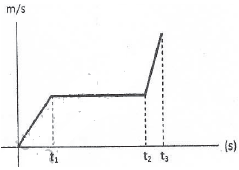 Constant acceleration indicated by a straight line perpendicular to the axis of acceleration (a). Based on the graph, the object moves at a constant velocity. Constant velocity indicated by a straight line perpendicular to the axis of velocity (v). 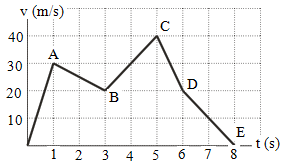 Based on the graph, displacement constant or object at rest. 11. The position of an object moving along the x-axis is shown by the following graph. The graph shows that the object moves at a constant velocity between the time interval…. 5-15 seconds and 25-35 seconds = Object’s displacement always constant or object at rest. 0-5 seconds, 15-25 seconds and 35-40 seconds = object moves at constant velocity. 12. The following graph shows the speed of the time function of two objects moving straight from the same starting position. After moving for t seconds both objects have the same position change. Determine the time interval and displacement of the object. 13. Based on graph below, the time interval when the object moves at constant acceleration and the time interval when the object is experiencing the greatest acceleration is …. If the graph is a straight line then the velocity is constant, if the graph is a slash then the acceleration is constant. The line is getting tilted, the acceleration is getting bigger.